We unfortunately don’t have a whole lot to report. 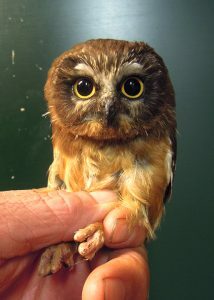 As expected, this has proven to be a down reproductive year for Northern Saw-whet Owls and they have been very slow recently. The adult Saw-whets came to a screeching halt on July 18. Juvenile Saw-whets have continued, but at a trickle. Thankfully, we are also catching some Long-eared Owls. The slow August nights have produced a total of 7 juvenile Saw-whets and 8 Long-eareds. The fact that we expected a slow season has made the slow nights easier, and the juveniles are just so gorgeous (top picture) we’re really appreciating each one. It’s also interesting to see the Long-eareds while they are actively molting. 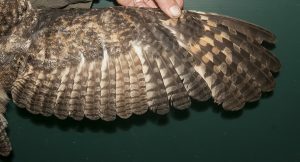 The below Long-eared still had some retained juvenile secondaries, but as always, has started its molt with its inner primaries. We never cease to be amazed at how regularly we find amphibians on our trail that don’t move as we walk right past them. 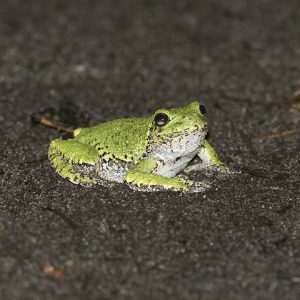 Gray Treefrogs in particular will remain on the trails for hours and not even flinch as we repeatedly have to walk right over them.